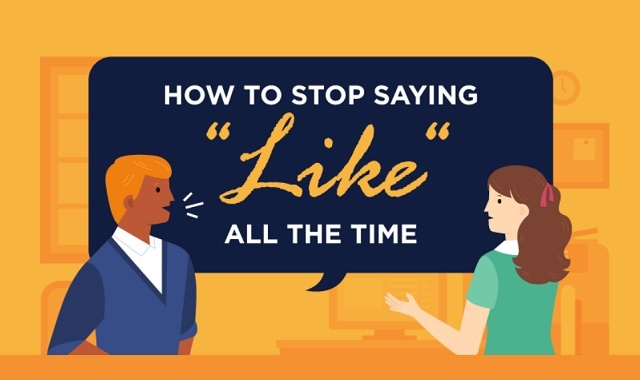 How to Stop Saying “Like” All the Time #infographic ~ Visualistan '+g+"
Do you ever find yourself saying "like" a lot when you're talking? It might be, like, so ingrained that you may not even realize you're doing it. The good news is, "like"ing is a habit that can be broken with a few simple changes to your speech. quickquid has put together a “like”reducing guide to help you get started. Try using some of these alternative words and mindful techniques to squash that filler out of your speech. There’s no crime in talking the way you naturally do, but having the courage to explore the full range of your verbal skills can help you to make a better impression on the people you meet.